Consumers have made it clear that they no longer want to see photoshopped or retouched advertising – and brands are finally listening. 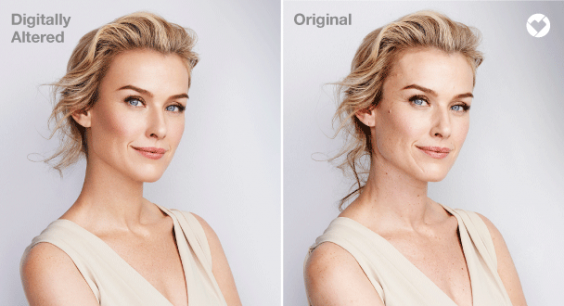 US drug-store giant CVS is the most recent company to announce an end to photoshopped advertisements – and the decision by America’s largest drugstore chain has the potential to influence other companies to do the same. However, the company is also urging brands sold in their stores to do the same – or face repercussions. According to the press release: “As part of this initiative, transparency for beauty imagery that has been materially altered will be required by the end of 2020,” meaning the brands can either follow CVS’s lead and discontinue the use of photoshopping and image altering, or CVS will place alert labels on their images. The decision, which was made “in an effort to lead positive change around transparency in beauty as well as to allow customers to differentiate between authentic and materially altered imagery,” according to the press release, is huge considering the 9,600 CVS stores nationwide. With brands and beauty suppliers such as Procter & Gamble, Johnson & Johnson, Unilever, L’Oreal, Maybelline and CoverGirl owner Coty sold in CVS stores, the move calls on these brands to also implement these changes. And as one of the nation’s largest beauty product sellers, with women making up 80 per cent of the brand’s consumers, CVS’s choice is an important step in creating a transparent future where unrealistic beauty standards are not reinforced.